will change the seed industry forever! An automated process with drying included! Fast process – ready in 1 – 3 days for most species! Excellent storability & optimised germination! 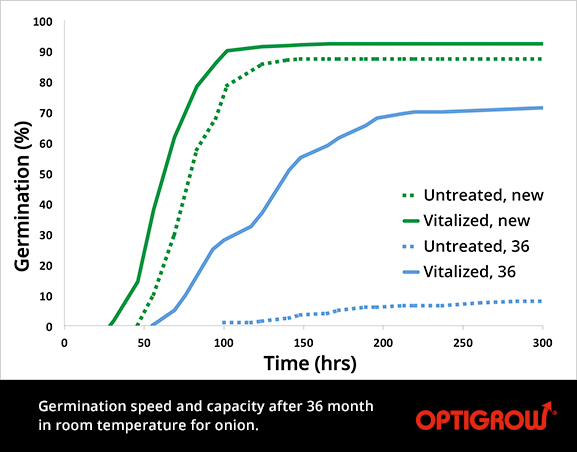 Vitalization is fully ecological and Optigrow® seeds therefore have an interesting potential on an expanding market. Early field emergence, reduced seed dormancy, uniform crops and strong weed competition are additional benefits offered by vitalized seeds. In this 2 min video we present the Optigrow® Vitalizer 90 Series and the simplicity of the fully automated vitalization process. Automated Seed Vitalization is the result of a joint effort involving Nelson Seed Development AB, Seed Processing Holland BV, the Swedish Innovation Agency (VINNOVA), Horizon 2020 and Entreprenörinvest Sverige AB, The Kamprad Family Foundation (Mr Kamprad is the founder of IKEA). By finely tuned interaction of air and water, vitalization brings forth seed properties that are likely to transform the business logic of the seed industry radically. With unsurpassed accuracy, the fully ecological vitalization process is interrupted just before the radicle is about to penetrate the seed coat. This is one of the key factor behind the unique storability and the rapid, uniform crop emergence offered by vitalized seeds. The documentation from vitalizing a great variety of seeds automatically is stored and held available in our comprehensive and well-systemised Bank of Experience. Therefore we will always be able to provide the formula for optimal setting of your seed vitalizing process – regardless of species variety or country of origin of your seeds!